The epic reading of Uncanny X-Men continues as the mutants relocate to Australia, battle cyborgs and aliens, and spread some Christmas cheer. It was 1988. Chris Claremont was now in his 13th year of writing this comic book series, which had flourished into Marvel’s best-selling title. It had become its own franchise, with the spin-off series New Mutants and X-Factor, and limited series like Wolverine. A third and fourth spin-off, Excalibur and an ongoing Wolverine, were getting prepared to launch later in the year. It sounds like everything was going great, but there was trouble. The launch of X-Factor over two years earlier had been done against Claremont’s wishes and without his or his editor Ann Nocenti’s participation. The book reunited the original X-Men characters from the 1960s but by doing so it resurrected Jean Grey, undermining both the celebrated ending of the acclaimed Dark Phoenix Saga, and the carefully executed retirement of her boyfriend and fellow X-Man Cyclops. The two books essentially agreed to ignore each other, but it was an untenable solution. As part of his retirement, Cyclops had married Madelyne Pryor, who just so happened to look eerily like Jean Grey. The two had a son. To go back to superheroing, it required Cyclops walking out on his family, a generally un-superheroic thing to do. As if that wasn’t enough, their infant son was kidnapped. Madelyne made her way back to the X-Men for help in tracking down her baby. Instead she became a supporting character in the book. This all happened over the course of years, where Claremont’s legendary slow-burning subplots were getting more and more drawn out with each new unresolved thread. So Madelyne ended up hanging around with the X-Men seemingly not looking for her baby. I wonder if Claremont was letting X-Factor resolve the missing baby story as an opportunity to redeem Cyclops. Whatever the reason, that book didn’t forward the plot either. So both parents ended up not talking to each other while their son was presumably being held by mutant terrorists the Marauders. No ransom was demanded by the villains. Basically, everyone forgot about it, except the readers. Now there had been some crazy stuff going on in Uncanny X-Men that would certainly prevent Madelyne from making good progress. And it’s possible efforts were happening off-panel. But it was a long time to let such a desperate plot point linger. 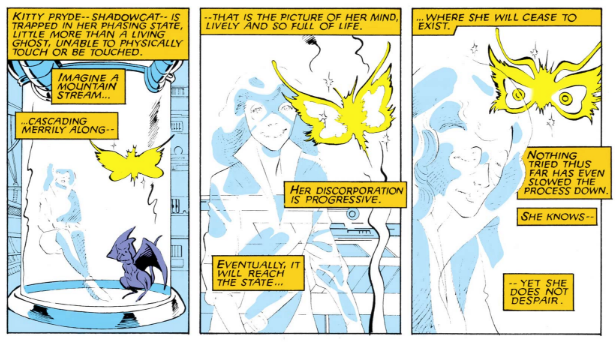 By 1988, longtime editor Ann Nocenti wanted to transition out of editing and into freelance writing (she would go on to have a well-regarded run writing Daredevil). Coincidentally, several editors were making the same transition, so Marvel took the opportunity to promote some assistant editors and reassign books. Bob Harras had been editing X-Factor soon after its launch and had proven he could handle a franchise with his coordination of the successful G.I. Joe mini-line of comics. So he was given Uncanny X-Men, New Mutants and the reprint series Classic X-Men. The entire X-Men line was once again under one editor. He would also get the new Wolverine series and the X-Terminators mini-series scheduled for later in the year. Only the upcoming Excalibur would be excluded (and he would eventually take it over in 1993). This gave the line greater coordination than it ever had before. Right away, letter columns in the back of each issue featured blurbs promoting the rest of Harras’ stable of X-books. The next summer crossover, Inferno, would more tightly weave through each book instead of the more isolated approach in Mutant Massacre and The Fall of the Mutants. No longer would X-Factor be ignored by the other books. And possibly most significant for Uncanny X-Men readers, the Jean Grey/Madelyne Pryor redundancy was forced to a conclusion and one that did not favor Madelyne. Really, this is the beginning of the end for Chris Claremont’s tenure as main architect of the X-Men universe and his first tenure as Uncanny X-Men writer. Legend has it Harras did not share the same friendship and loyalty to Claremont like previous editors. But Claremont was too big of a name and couldn’t be replaced. Yet. It would be another 3 years before superstar artists made it easier for Claremont to be pushed off the book. But we’re not there yet. Back in 1988, the X-Men had just been killed during The Fall of the Mutants and then, unbeknownst to the rest of the world, brought back to life by the mystical Roma. Still feeling the aftermath of the Mutant Massacre, the X-Men decided it was safest for their friends and allies if they were presumed dead so they could stealthily take the fight to their enemies. This set of issues, Uncanny X-Men #229-234, is the start of this new mission, affectionately named the Outback Era due to the team’s new base of operations in the remote Australian Outback. The more aggressive strategy of the X-Men was very in-step with the increasingly “grim and gritty” approach of the industry at the time. The tsunami effect of Watchmen was still just getting started. Still, I was glad to see a step away from that for a moment with Uncanny X-Men #230, which unexpectedly turns into a rather charming Christmas story at the end. This batch is highlighted by the return of the Brood. It was good to see a follow-up to the original Brood Saga but where that story really excelled with some excellent pacing and tension, this ended up feeling a bit one-note. I guess it was more going for a thrill-ride feel and on its own it was a fun adventure with some good creepiness in the beginning, but it just didn’t continue the strength of the original. Probably the best part was a twisted dream sequence of Madelyne Pryor getting stripped of her baby and her own facial features, which are given over to a blank cypher to restore “the original,” Jean Grey. It’s during these scenes that she ends up aligning with the demonic S’ym because she thinks she’s just dreaming. It’s messed up and positions the character for the Inferno event but it’s a cool visual. Despite my decidedly Claremont-favoring summary of history above, I have to say his writing has gotten to a point where I find it a bit of a chore to get through. It’s very possible he’s chafing at the increasing editor oversight. Or it could just be the natural evolution of his style. Whatever the cause, his scripting is getting increasingly dense and stilted. 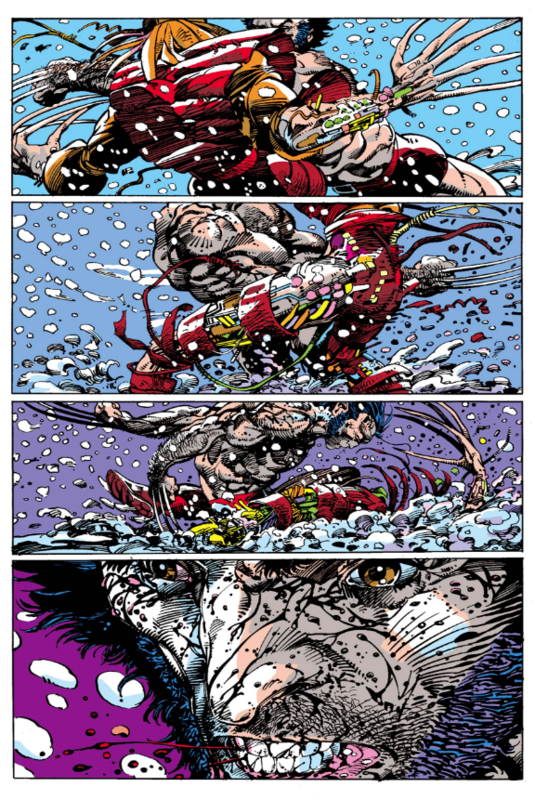 Marc Silvestri is more than competent as artist on the book, with very fluid storytelling. 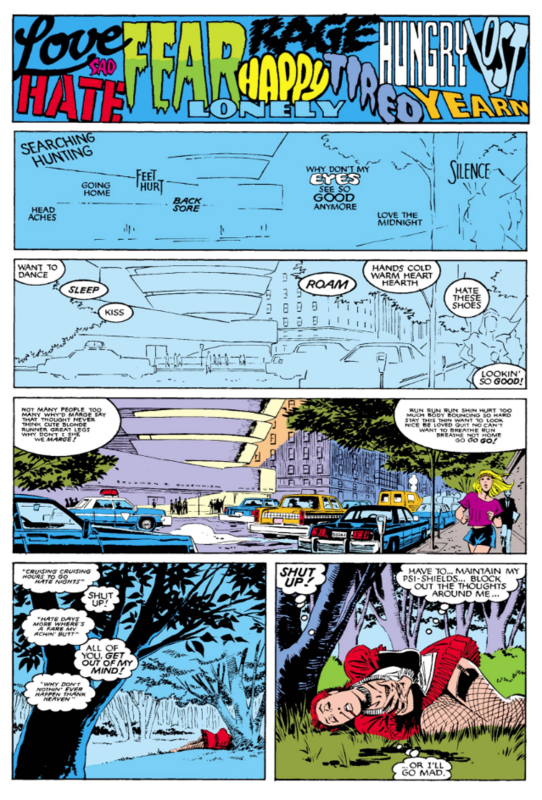 Maybe their styles don’t mesh but the rhythm of Silvesti’s pages gets completely bogged off by Claremont’s dialogue. I’ve now taken to reading the issue, and then sometimes days later going back through the entire issue again just looking at the art and ignoring 90% of the dialogue. The storytelling is so sharp and effortless with too much of the script superfluous. Claremont’s plotting of individual issues and story arcs is generally still spot-on though, and even when it’s a mostly action-focused story, he continues to live and breathe these characters. 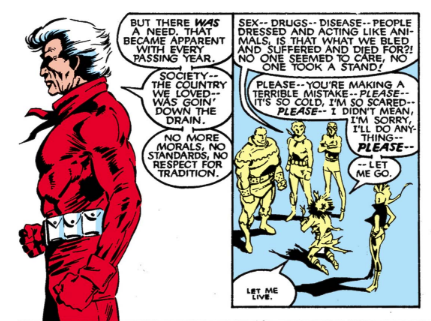 Next up: An apartheid analogy in the form of the fictional nation of Genosha. It’s been four months but I’m still here reading X-Men comics! Well… more or less. I got a bit sidetracked. And I’m about to get sidetracked again. But I wanted to get in one more post to finish up the long build-up to the Fall of the Mutants, which sets up the next sustained status quo for the book. For those just joining, I’ve been (at times, very slowly), reading the entire Uncanny X-Men comic book series, from its start as X-Men by Stan Lee and Jack Kirby in 1963, to its resurrection by Len Wein and Dave Cockrum in 1975, to the legendary stories by Chris Claremont and John Byrne that turned it into Uncanny X-Men, the biggest-selling comic at Marvel Comics and the headlining title of a franchise. Even more so than the previous year’s Mutant Massacre event, each participating comic book series pretty much kept to itself. So I didn’t read New Mutants or X-Factor, only the Uncanny X-Men issues (#225-227) of The Fall of the Mutants, which were originally released in late 1987. I’m also including the semi-epilogue issue 228. In many ways, these three issues are the culmination of some long-percolating sub-plots. Anyone jumping on with this event was probably pretty confused. But for those that had been following the book, the Storm and Forge thread gets some good pay-off. In one of those great comic book oddities, they spend a year exiled on a fake Earth in the span of a night on the normal Earth. At this point, the two are doomed lovers who keep getting close to a happily-ever-after, only to find out it’s not the real thing. 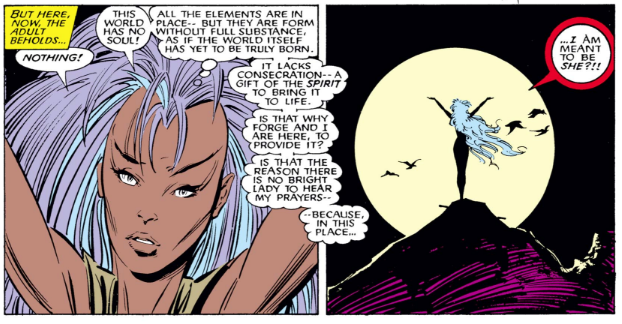 While there is tragedy to them, Storm gloriously and finally gets her powers back, another subplot that’s been running through the books for some time. Colossus also makes a return to the book. Apparently he was planned for the upcoming spin-off book Excalibur until it was decided his powers would be redundant once Captain Britain was added to the cast. After so deliberately being shuffled off the book, he’s shuffled right back on, at last finalizing the X-Men roster that will be in place for the next year or so. Speaking of changed plans, the original plot was intended to use elements of a story by Alan Moore that had appeared in Marvel UK books. Apparently, Moore’s contract with Marvel was unique from State-side freelancers, giving him more authority over what he’d created, so Claremont had to make some big changes to his story. Probably the Adversary story would’ve ended in the previous issues, and this would’ve been an entirely new threat. Still, the mystically cosmic battle may seem like a mismatch for X-Men adventures, which usually work best when dealing with themes of racism, bigotry and alienation. But it ends up serving as a good juxtaposition against yet another long percolating subplot, the Mutant Registration Act. Anti-mutant hysteria is at an all-time high, and the X-Men’s classically heroic sacrifice ends up being the best pro-mutant propaganda. Unfortunately it doesn’t show that any real change came from it, although that’s probably a more realistic ending. Pencil/ink team Marc Silvestri and Dan Green continue an enjoyable run of issues, adding some fun and even funny visuals. 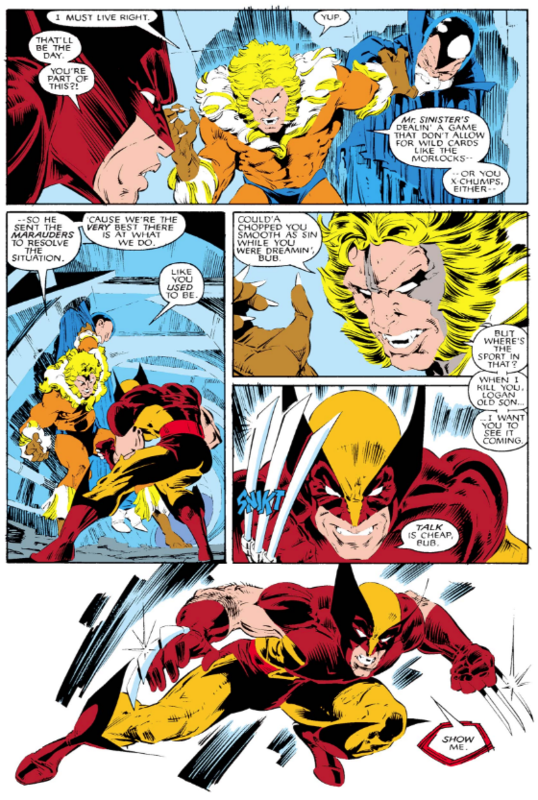 Silvestri particularly shines during the battle with Freedom Force in the first issue. The only real downside is that his pages sometimes feel a bit cramped with small panels crowded by excessive dialogue from Chris Claremont. This might be more on Claremont’s shoulders, as his scripting approach has solidly taken on the verbose style that really defines the book for a long time. Letterer Tom Orzechowski hits his 100th issue on the book and continues to be a vital element of the book’s winning look and feel. The epilogue issue is a bit forgetful. It seems like a leftover plot from Dazzler’s solo series, and is mostly a flashback from before the Fall of the Mutants story. Only the last page has reference to the X-Men’s death. Rick Leonardi’s art is nice though. These stories weren’t my absolute favorite but the Storm stuff is great, the inclusion of Freedom Force was fun, and I’m intrigued to see the new status quo get rolled out. The next batch of issues see the X-Men start a new life in Australia. But first… As I said in the beginning, I’m going to be putting my Uncanny X-Men re-reading on hold while I join my fellow Part-Time Fanboy podcasters for a re-reading of Fantastic Four #1-100 by Stan Lee and Jack Kirby. This is the comic that created the Marvel Universe, so I’m really excited to be diving in to this book. We plan on recording early this week, with the first episode to go live pretty quickly after that. It’s 1987 and the Fall of the Mutants is almost here. But first we have some set-up to do. There’s some good stuff in these issues, Uncanny X-Men #220-224, but it’s definitely a lot of arranging the chess pieces for the big summer event. Storm gets most of the focus, as her subplot finally boils to the top. Meanwhile the rest of the team continues to establish themselves as the new official line-up, with Dazzler usually getting highlighted. I’ve been reading the entire Uncanny X-Men series (very slowly) from it’s start in 1963 and am trying to make it all the way through to 2011 when the original series ended. If I can make it through that, I may continue on. We’ll see. You can read all of the entries here. I have to confess, I’m not digging this period as much as I thought I might. I’m not really connecting with the new team members and part of that feels like it’s mostly The Dazzler and Friends Show. In this batch particularly, if an issue is going to focus on a single member of the team, it’s always Dazzler. Maybe she’s meant to be the POV character, similar to Kitty Pryde’s original role, but it just ends up feeling very unbalanced as an ensemble book. She’s OK as a character but I’d sure like to learn more about the others. Longshot is basically in a constant state of staring wide-eyed at the world, which is amusing as a supporting character role, but nothing has been done with it. 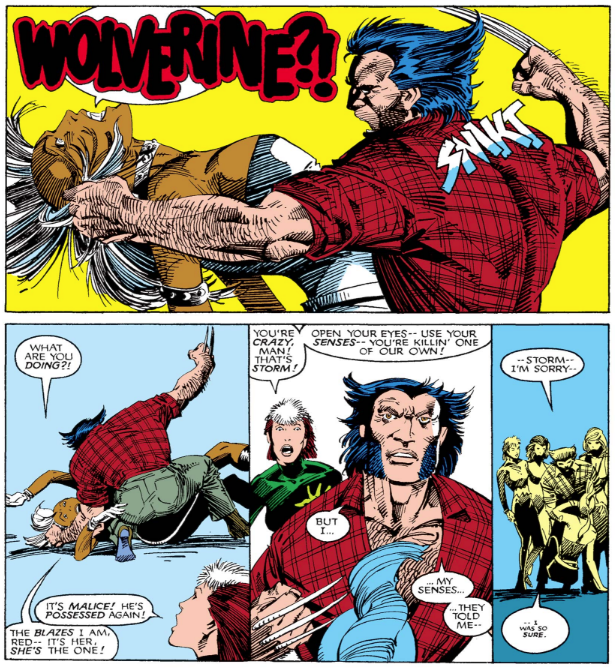 In fact, nothing has been done to fill in his back story at all for those that hadn’t read the Longshot mini-series or the Uncanny X-Men Annual that brought him onto the team (like myself). We’ve gotten very little insight into how he feels about his situation or why he’s even on the team. Emotionally, he’s pretty much in the same state in every scene. Even in battle, his luck powers help everything work out fine for him, so he never seems to be in any danger. This flat character state suggests there’s nothing else to him. I know that’s not the case but it’s approaching a year and we’ve really gotten nothing on him other than he has no memory and this world is strange and wondrous to him. 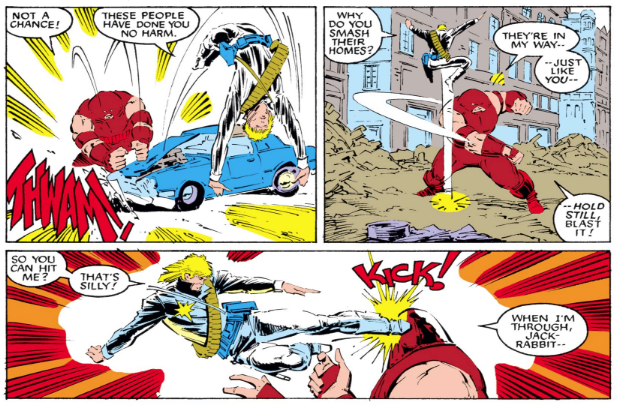 Havok certainly makes up for Longshot’s lack of emotional depth. He’s been forced back into the mutant world and his girlfriend seemingly betrayed him to go lead the bad guys. Like his brother Cyclops, Havok can get a bit cloying and winy but he at least wins sympathy points. In one scene, his girlfriend just taunts him to strike at her as she escapes. He finally does and then she just laughs at him as her powers block his powers. It was a tad over the top in how evil she was being, but to be fair, she is being mind-controlled by a character named Malice. Psylocke is probably the most interesting to me, of the new members. I like the juxtaposition of her pull to be more cold-blooded despite her look with her frilly pink costume and hair. But she hasn’t gotten all that much focus since she officially became a member of the team. She’ll make a comment here or there that reinforces she’s willing to go further than other members of the team, but we get little insight on her internal push and pull. Poor Rogue really hasn’t been doing anything other than acting as a foil to inspire Dazzler stories. 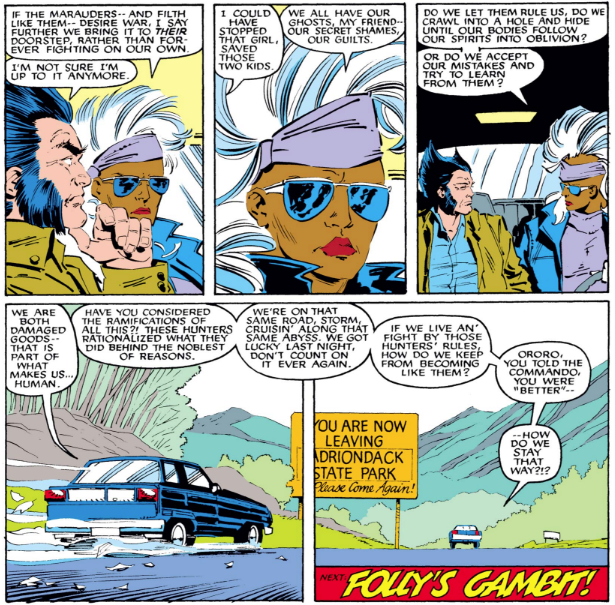 Other than that, she was used as a plot device: she got a warning that the X-Men are going to die in Dallas while helping Storm, which of course promptly inspires all of the X-Men to immediately run to Dallas. What’s crazy is that this is a very turbulent time for the X-Men. They are without a home, the Marauders are hunting them and their loved ones, mutants are feared and hated more than ever – there’s a lot there for characters to reveal themselves through their response. And we don’t get that like we used to. I don’t want to make it seem like I’m hating the new team, though. While not as strong on character development and exploration, there was a fun X-Men vs. the Marauders rematch in this batch of issues, that was mostly well choreographed. And Marc Silvestri makes for a good regular artist with this cast (especially when inked by Bob Wiacek). It just doesn’t seem to explore the characters quite like it did in years past. Speaking of the Marauders, this batch of issues features the introduction of Mr. Sinister. This villain was teased as the mastermind behind the murder of the Morlocks during the Mutant Massacre. (Wow, there are a lot of m’s!) He is quickly established as being very powerful, easily subduing Sabretooth. This becomes a common trick. Whenever you want to establish a new character as a big deal, have him easily handle one of the cool characters like Wolverine or Sabretooth. Mr. Sinister is a goofy name, and apparently the original plan was that he was going to be the manifestation of a little boy’s idea of a bad guy. That also fits in with the crazy flamboyant design of the character, complete with jagged teeth and a cape made of streamers. 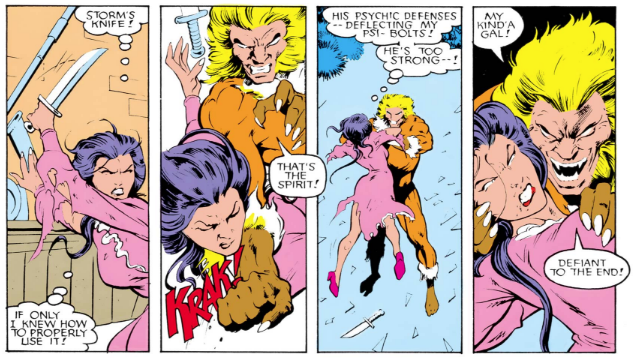 At this point, we don’t get any real clarity on why he wanted the Morlocks killed, but now he’s obsessed with eliminating Madelyne Pryor, who ends up semi-joining the X-Men in this arc. 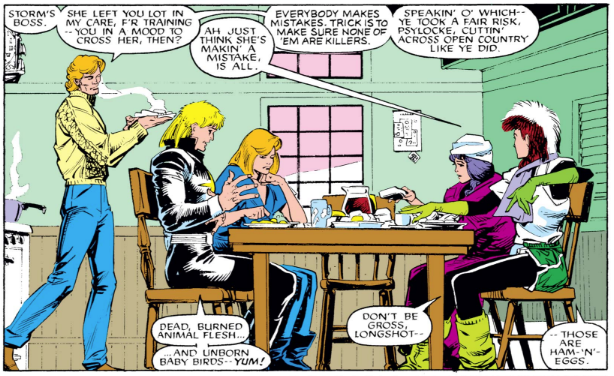 Madelyne Pryor continues to be an odd character. She was created with very strong hints that she was Jean Grey reborn following that character’s death at the end of The Dark Phoenix Saga. Then those hints were dismissed as mere coincidences, allowing Cyclops to retire from superheroing so he could marry Madelyne and then have a baby together. Fortunately those hints haven’t been forgotten. There’s even a panel with a Phoenix-like bird in flames over Madelyne during a flashback to her mysterious plane crash. Cyclops has left Madelyne to reunite with Jean Grey on X-Factor, and unbeknownst to him (I think) their baby has been kidnapped. Madelyne rightly blames Scott for a lot of this because it’s generally not cool to walk out on your wife to go hang out with your ex-girlfriend. She and Havok bond over having their significant others abandon them, and Madelyne proves herself to be tough despite having no powers. But back to that character development stuff. Fortunately, the two mainstays on the team, Storm and Wolverine, are getting more attention in this department, although lesser so Wolverine. He is well established as the most popular character on the book, but most of his character development has been happening almost in the background or as as small nods within a scene. He’s the reluctant leader of the team during Storm’s absence. Recent injuries have made him doubt his skills. He’s also more tired and doesn’t seem quite on his game like he used to. He’s moving into the wise, old samurai role. These are all little hints dropped in, which make for a nice touch. Storm gets some really good focus in this set of issues. For a bit too long, she’s been searching for Forge, the man who invented the high-tech gun that took her powers away. There’s a great sequence of her going back to his old penthouse in Dallas, and her discovering how obsessed he might’ve gotten about her after she left him. (Although there’s a really lame metaphor sequence with two birds, with one that has a little white mohawk. Guess which one is supposed to be Storm.) To help find him, she teamed up with his old mentor, Naze, who believes Forge has been corrupted by an evil Native American spirit called the Adversary. In truth, the Adversary is disguised as Naze, and she’s being manipulated to stop Forge. It’s kind of a classic setup, and I kept waiting for her to discover she’s been duped and for her and Forge to team up and defeat Naze/Adversary. Surprisingly, she finds out too late, and they actually lose. While I was disappointed that Storm was duped, it made for a more exciting read, and of course sets up the big encounter to come in the Fall of the Mutants event. Up next: The X-Men’s second official summer event, The Fall of the Mutants. Yes I’m back for another thrilling installment of me talking about what I’m reading! I’ve been reading the entirety of Uncanny X-Men, stretching all the way back to 1963 and working my way up to the present (or thereabouts). Right now I’m in the mid-1980s, and nothing is more indicative of that than the arrival of an omnipotent white guy with Michael Jackson hair. This batch of issues covers Uncanny X-Men #199-204. This entire era of Uncanny X-Men is getting really hot and cold. Last time, “LifeDeath 2” was the stand-out among some otherwise unspectacular stories. This time, “The Trial of Magneto” in issue #200 and its lead-in of #199 lead the pack, with the rest mostly running the spectrum of just OK to downright forgettable. From what I’ve read around the intertubes, a number of plots that writer Chris Claremont wanted to do during this period were completely derailed, so I will charitably excuse the subpar issues as him trying to recover and figure out what to do instead. Besides, he’s crossing his 10-year anniversary with the title at this point; every issue can’t be God Loves, Man Kills. Still, “The Trial of Magneto” is a big status quo change for the title and the characters. It effectively writes Professor X out of the book. I think this makes at least the third time he’s been removed, and it makes sense. Having recently regained the use of his legs (by being cloned into a new non-paralyzed body), he’s been a more active member of the team, even serving as field leader on missions. With his considerable mental powers, Claremont had to keep coming up with reasons for his powers to not be working at full strength so he wouldn’t render the rest of the team useless every issue. This problem of Charles the father figure rescuing his students goes all the way back to some of the earliest issues of X-Men, where he’s mind-wiping villains left and right while his original students ran interference and played clean-up, or just stood around while he did all the work. (Of course, replacing Prof. X with Magneto doesn’t really fix that problem, as Magneto is extremely powerful as well; probably one of the reasons why Magneto mostly sticks to the New Mutants series, and only occasionally directly joins the X-Men in battle.) He would sometimes leave for secret missions or go into seclusion to work on some special project in the basement and finally was thought dead toward the end of the original ’60s series. Then in the ’70s, when he thought the X-Men were dead, he abandoned his mission and took off with his space girlfriend. 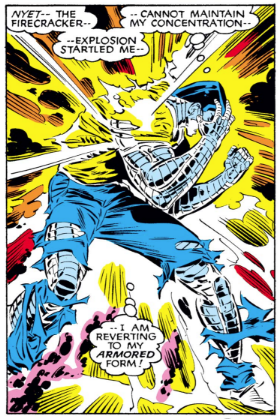 More recently, his powers were disrupted by the arrival of the Beyonder (who we’ll get to in a moment) and then he barely survived a hate crime. Since he didn’t properly recuperate from that attack, he’s now on death’s door, so they shuffle him off to be cared for by the super high-tech space pirates, the Starjammers. Due to some political machinations, they can’t teleport him back after he’s cured so he’s effectively stuck in space with the X-Men having no idea what became of him. For all they know, he could’ve died after being whisked away. Or maybe Magneto killed him and this is all a ploy. I was surprised that last theory didn’t end up having more legs. Cyclops and maybe Wolverine briefly consider it but after a few issues, it seems most everyone is reasonably convinced that Magneto is truly trying to be a good guy. I like the idea of some of them believing him but considering the wacky plots he’s tried to pull off in the past, I think some of them, particularly the ones that have been around the longest, have good reason to not buy into what appears to them to be a sudden change of heart. But the change of heart hasn’t really been all that sudden. The wheels were set in motion for this back in Uncanny X-Men #150, when signs of a sympathetic Magneto began to surface. Fifty issues later and he is now officially an X-Man. Simultaneously, the X-Men have had to take an increasing number of actions that put them on the opposite side of the law. So it’s not that Magneto has done a 180, it’s that both sides have gradually shifted about 90 degrees toward each other. I could quibble on just how thorough this has been depicted and reinforced, but overall the execution exhibited more patience and methodical plotting than almost any other mainstream comic book writer up to this point. Immediately following that issue, the rest of the team responds to what’s happened, including the birth of Cyclops’ son. 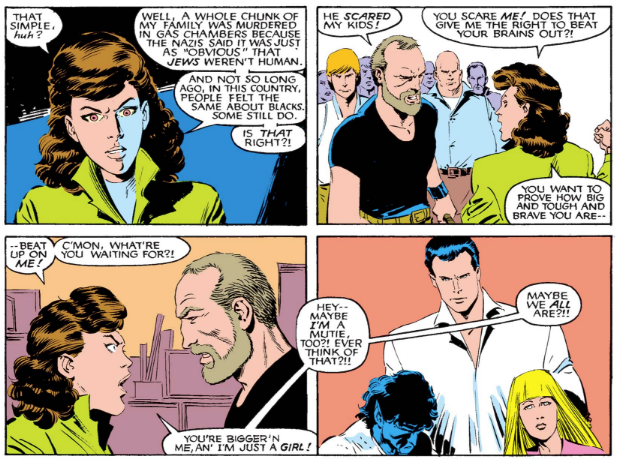 Scott was pulled back onto the team over concerns with Professor X’s health, and it was discovered that his wife/Jean Grey double Madelyne Pryor was pregnant. This surely skewed many young children’s perceptions of pregnancy. It seems to happen very quickly and we never really see her showing as pregnant. But here he his, a baby bouncing Summers. Because Cyclops doesn’t know how to human, instead of being a proud father, he broods over the loss of Professor X and the arrival of Magneto. This mostly makes sense, as Prof. X is his father figure and since his teen years, Magneto has been their biggest enemy. But could he maybe have a little bit of happiness? Poor Madelyne feels pretty rejected and it leads to an argument between them over whether Scott will be returning to the team, which seems like he just wants to bolt because he looked around and suddenly saw a normal human life with a wife and child ahead of him. Scott really doesn’t come off looking good here, and while there have been hints of this in the past, this is the first big step toward a really unfortunate period for the character. Much of it is editorially forced, as the character here is being set up to co-star in a new spin-off book called X-Factor, where Jean Grey and the rest of the original X-Men will reunite. While this issue ends with Scott relenting leadership of the X-Men over to Storm and departing from the book once more, Claremont’s plans to have Scott permanently retire end here. Speaking of the leadership mantle, Storm challenges Cyclops to a duel in the Danger Room, which is an overly simplistic way to determine who should be leader. Even though Storm is still powerless, she’s more clever, strategic and determined. That, and the editors have predetermined the outcome. While I’m happy Storm wins, it’s one of those comic book fights where you can feel someone’s finger on the scale to skew the results. After that, we dive right into Secret Wars II crossovers. I didn’t read the main mini-series (mercifully) but these issues of Uncanny X-Men are tie-ins to a big Marvel event that consumed the majority of Marvel’s publishing line for about 9 months. Fortunately Claremont dealt with this intrusion fairly gracefully. I was able to read these issues without feeling lost and they reasonably stand on their own without reading other crossover issues or the main mini-series. The Beyonder is this cosmic force that assumes the guise of a Michael Jackson-haired human as he tries to understand what it means to be human. 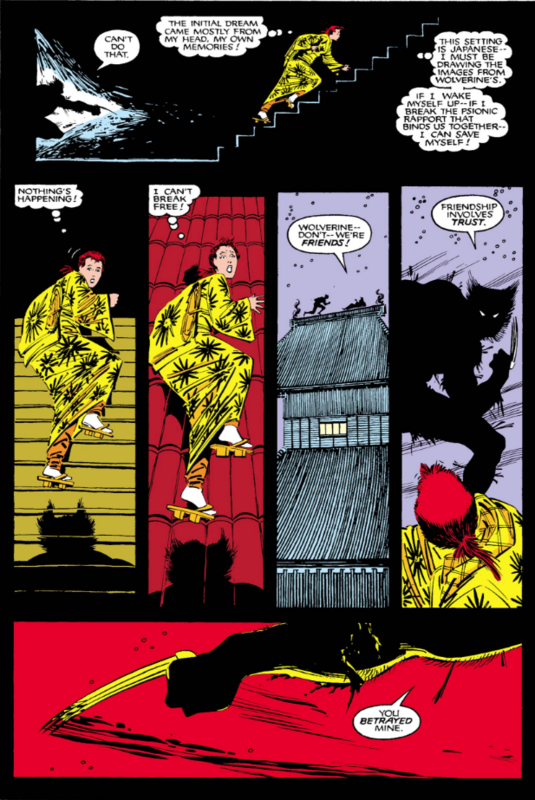 This leads to a confrontation with Rachel Summers, who has now fully assumed the identity of Phoenix. Naturally this pulls the rest of the X-Men in where they end up hanging out in San Francisco for several issues. 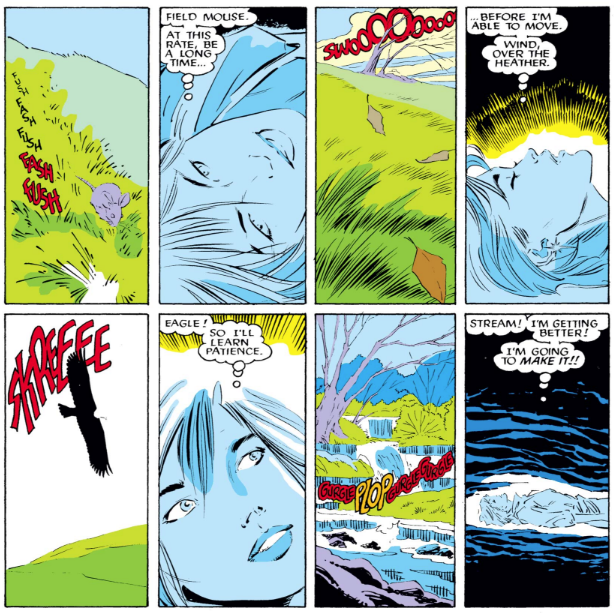 There are some good moments here, mostly for Rachel as she deals with the challenge of the Beyonder and how far she’s willing to go to try to defeat him. It also appears to be her wrestling with the full Phoenix Force, which ultimately corrupted her mother. After a beautiful Starlin-esque 3-page sequence of her encompassing and experiencing every living being in the universe, and being challenged by Storm, her own humanity wins out over the corrupting aspect of the Phoenix Force. It’s a great show of strength for Rachel, who has been a bit maudlin since her arrival in the book, and a great moment of redemption for the Phoenix name since the Dark Phoenix Saga. It also makes a strong case for the possibility that Rachel has a stronger will and is a better host for the Phoenix Force than Jean Grey. The last issue in this set deals with Nightcrawler, who it’s acknowledged was curiously left out of the Beyonder confrontation in San Francisco. He’s having a real crisis of faith over the Beyonder’s God-level abilities and his motivations, as well as regret over his doubt-filled stint as team leader. It’s basically an adventure story to return the character back to his more swashbuckling self but it spends a bizarre amount of time on a damsel in distress character who he eventually rescues. It’s also the villain Arcade again, which seems crazy since there was a story starring Colossus and Kitty fighting Arcade within the last year. He’s such a throwaway villain with no thematic tie to the X-Men. I’ve never gotten the appeal of the character and there’s really no compelling reason given for why he’s popped up so frequently. The story itself feels way too inconsequential and ends on some surprise reveal of the damsel’s name, which has zero impact because the name has no relevance to anything that’s come before. The damsel’s revealed name is lifted from some book series that I’m not familiar with that otherwise has no connection to the X-Men franchise. Apparently this issue was supposed to begin an origin story for Nightcrawler but I guess the creators weren’t really feeling it, so they just abandoned the plot and left this as a self-contained and ultimately forgettable story. June Brigman, who was fantastic as the co-creator and original artist for Power Pack, does the art for the Nightcrawler issue. Power Pack is a better example of her talent. She’s inked by Whilce Portacio, who might not be meshing well with her stylistically. He will eventually show up as a big hit artist on the series in the late ’80s and early ’90s. The rest of this batch continues John Romita, Jr.’s long run on the book. He continues to be solid, consistent and capable. His Magneto, particularly in issue #200, has a regal air about him but retains a humanity, which really feels appropriate for the story. His scratchy/blocky stylistic quirks are starting to creep in but it doesn’t yet overwhelm his character body language. Romita is joined by guest inker Al Williamson for a few issues, and I think I like this pairing slightly better than Romita with Dan Green. Rick Leonardi handles Uncanny X-Men #201 and it’s too bad he’s only ever pulled in for fill-in issues. Whilce Portacio inks here as well and they seem a better fit. I think Leonardi would’ve made a great regular artist for the series. He’s expressive with great character acting and a fun, recognizable style, which would be a good counter-balance as the series entered this darker period. Fortunately, Secret Wars II is now over. In the aftermath of The Trial of Magneto, mutants are unambiguously hated and feared. While the charges against Magneto were dropped (probably would’ve been declared a mistrial anyway, with the interruption of Fenris), it doesn’t improve public opinion of him or the X-Men. 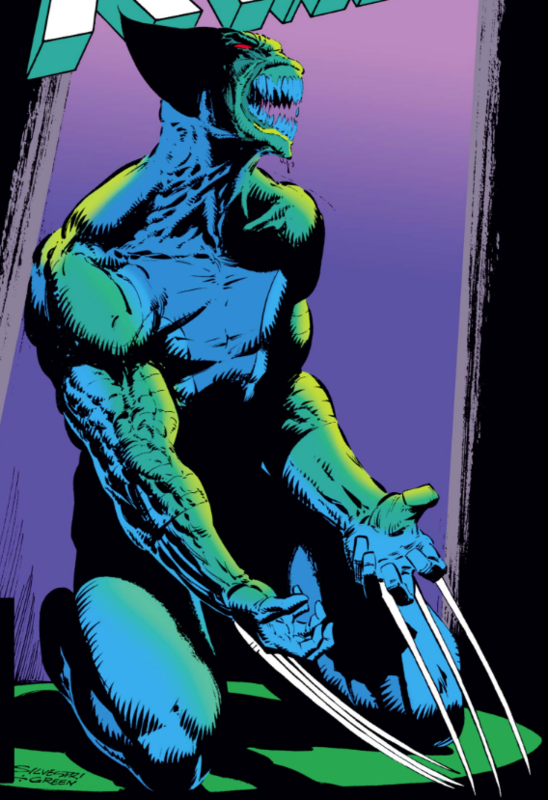 Next up: Barry Windsor-Smith returns as artist for a third issue, this time focusing on Wolverine. Plus, other things!